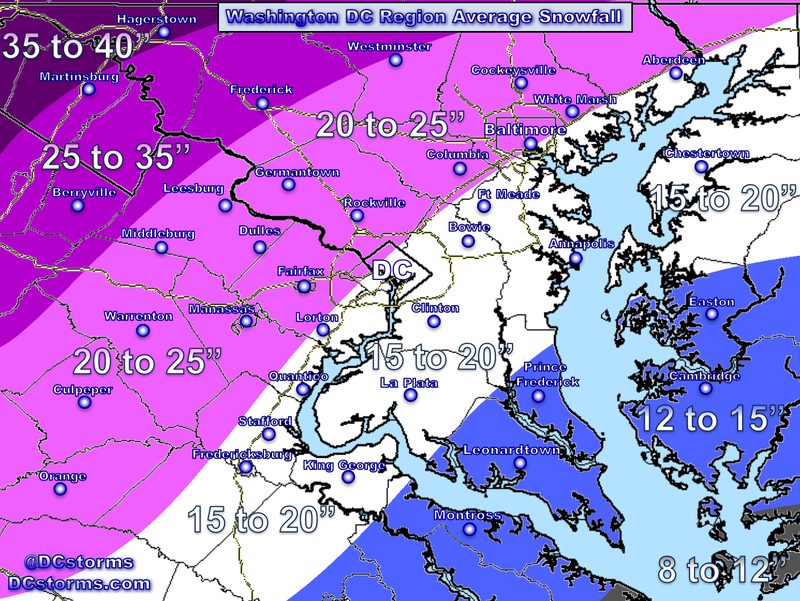 ** If Reagan Washington National Airport receives over 20.5″ of snow this will be DC’s SECOND LARGEST SNOW STORM ON RECORD… If Reagan receives 28.1 inches of snow this would be THE LARGEST SNOW STORM IN ONE HUNDRED AND FIFTY YEARS OF WEATHER RECORDS! The water content of this snow will be higher than the December snow storm. With winds gusting to 30 mph on Friday night through Saturday, trees could come down under the weight of the snow causing sporadic to scattered power outages, especially from the immediate metro area points east (closer to the tighter pressure gradient). As colder air wraps in Saturday, the snow will become drier which will help limit power outages. 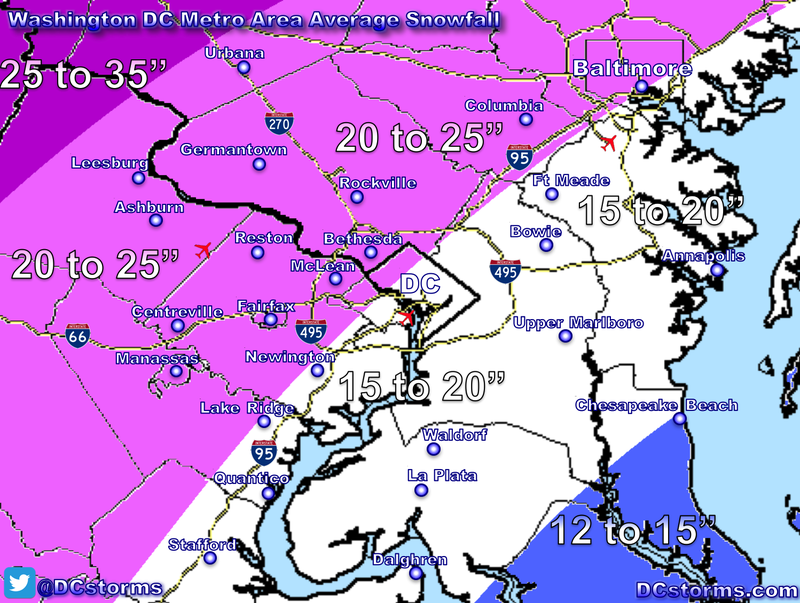 Snow begins right around noon (earlier south, later north) in downtown Washington. Heaviest snow falls Friday evening through Saturday afternoon. Expect white out conditions with visibility dropping to below a quarter of a mile at times with thunder snow possible (intense vertical motion in atmosphere). I predict that the Federal Government will be CLOSED on Monday due to clean up of the on/off ramps around the Capital Beltway as well as the clearing of federal parking lots. 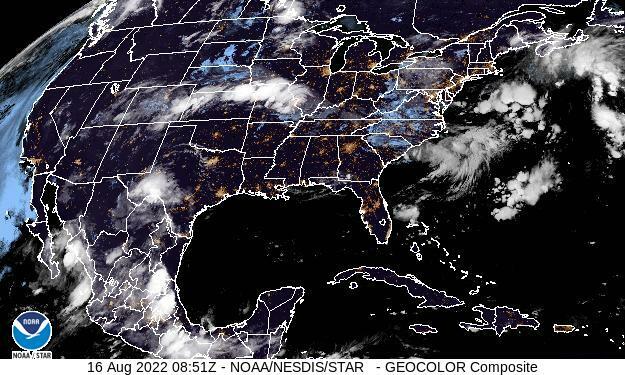 I wouldn’t be surprised if the Federal & State Governments are closed Tuesday & Wednesday and if UNSCHEDULED LEAVE continues through much of the week. Public schools will be closed for two weeks. 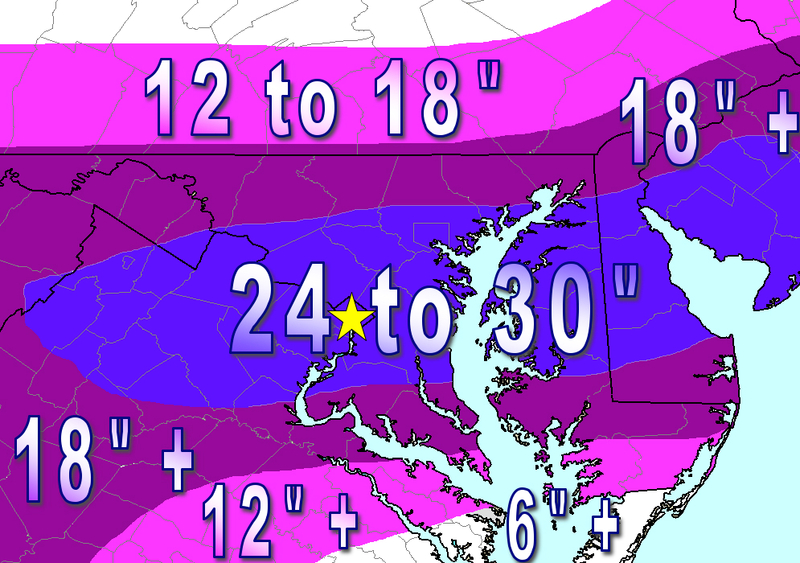 Colleges in the area will likely be closed the entire week… maybe more. Another snow event is possible Tuesday (right on the heels of this historic blizzard)… this one looking lighter at this time. The winter of 2009/2010 WILL LIKELY BECOME WASHINGTON’S SNOWIEST WINTER ON RECORD. This storm is huge! The prediction was right! Hi Tim, This is it, your Dream Storm for sure.